Our red oak vent covers by Accord are made from solid North American wood and are left unfinished. These return air grilles, made for the wall or ceiling, can be stained to match any room in your home! Oak vent covers are a great alternative to traditional metal grilles which can rust over time. 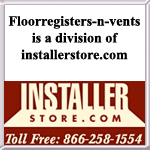 Replace those return air grilles with this great wooden vent during your remodeling projects for an affordable price. 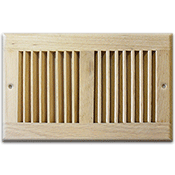 These oak vent covers are open slotted grilles which do not come with a damper. The return air grilles can be used in both your heating and your cooling needs as it allows air to constantly flow. Accord oak vent covers are 1/2" thick and are easily installed into your wall by mounting with screws. The return air grilles come with screws. 61-0100 10 x 6 Dimensions will vary. 61-0101 12 x 6 Dimensions will vary. Tip: When ordering return air grilles, it is the industry's standard to order by the hole opening in your wall or ceiling. Do not measure any previously owned grill. The 10 x 6 oak vent covers will cover a hole measure 10" x 6". These return air grilles are also offered in a finished stain for those looking for a quicker installation project. Order the oak vent covers now to update your style and give your home a more natural feeling. Choose Size 61-0100 10" x 6" Unfinished Oak R.A.G. 61-0101 12" x 6" Unfinished Oak R.A.G.